Thallus with branched uniseriate erect filament several mm long arising from an endophytic base without a disc; branching only in proximal to mid-region of thallus. Filaments uniformly 20-25 µm in diameter, cells longer than broad in proximal regions, usually broader than long in distal regions. Monospores formed by unequal division of vegetative cells. Found as an epi- or endophyte on Ralfsia and some other brown algae. Recorded from Cape Point to Double Mouth, near Morgan Bay (17-43). Warm temperate European Atlantic, Namibia, Morocco, also recorded from California and Oregon (AlgaeBase). Further information on South African material of this species is found in Papenfuss (1952) and Stegenga et al (1997). 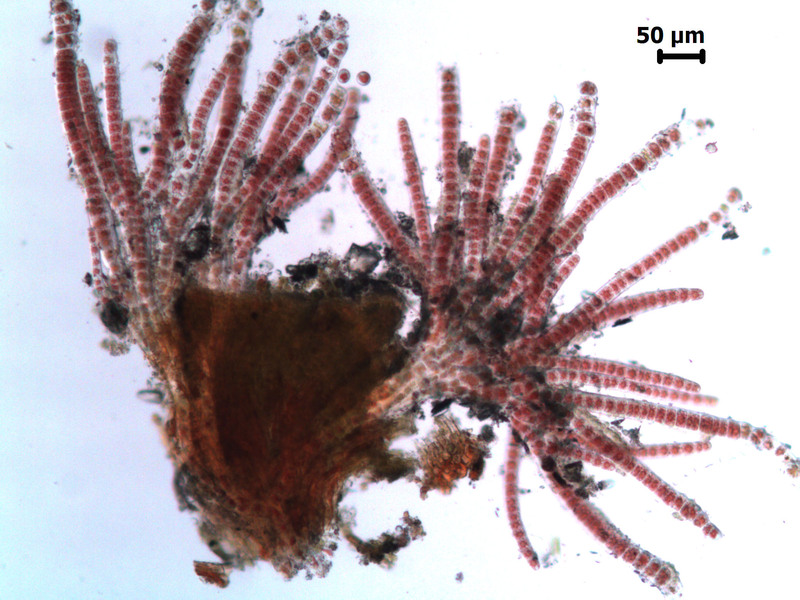 An unnamed, similar species of Erythrotrichia (described from the west coast by Stegenga et al 1997: 218) has been found as far east as Keiskamma Point (Stegenga et al 2001). This entity has an endophytic base and emergent branched filament up to 3 mm long: it differs from welwitschii in that its multiseriate distal region becomes tubular and up to 100 µm in diameter. 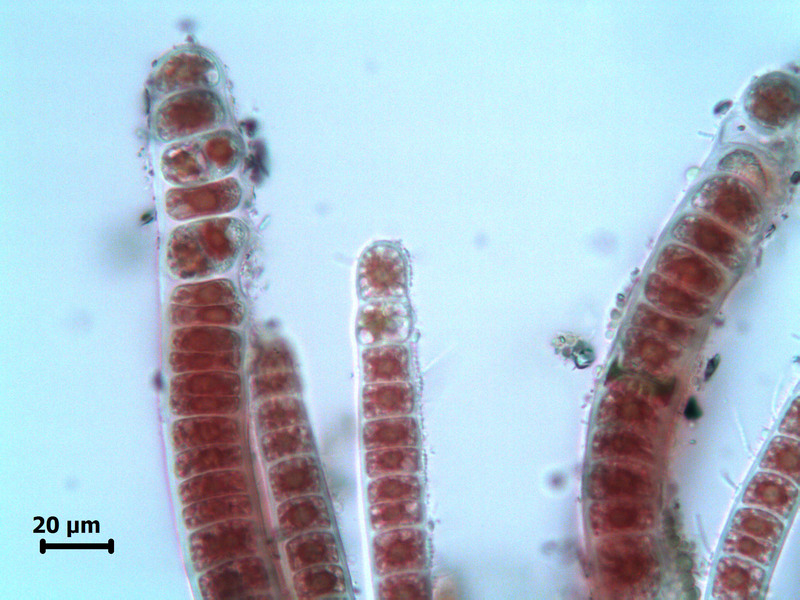 Erythrotrichia welwitschii, showing microscopic habit on the right and detail of a filament with monosporagnia on the left. 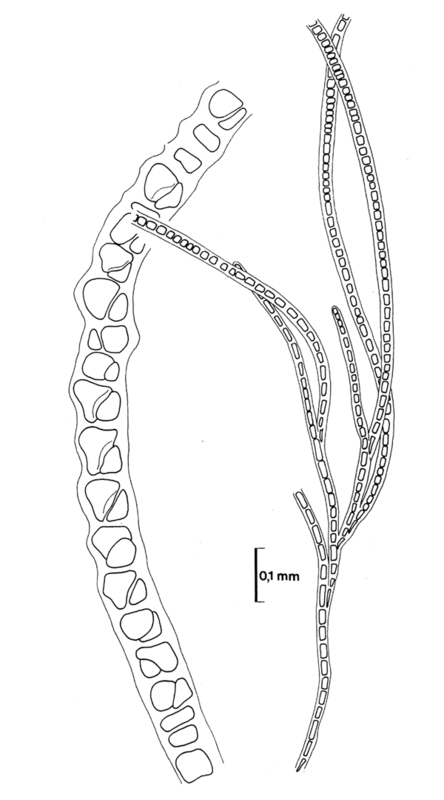 This illustration reproduced from Stegenga et al. 1997. Batters, E.A.L. (1902). A catalogue of the British marine algae. Journal of Botany, British and Foreign 40 (Supplement): 1-107. Papenfuss, G.F. (1952). Notes on South African marine algae III. Journal of South African Botany 17: 167-188.